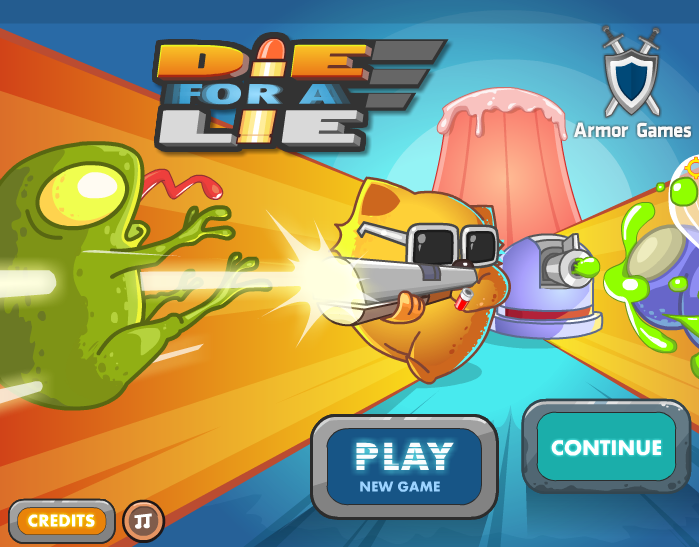 Die for a Lie, by SGH Games. It’s Ryan from ryviews.com. I’m here today in my very first video Ryview. It’s for Die for a Lie, by SGHGames. Die for a Lie is primarily a shooter, but it also has some defense elements. The player controls this cute little cat, who if I do say so myself has some kickass shades. He’s defending cakes from marauding inspects and vermin. And he’s doing that with high powered weaponry. The game starts off fairly slowly. I felt like the first few levels were a little repetitive. It was slow and tedious trying to shoot all the enemies with your limited skill set. However, after a few rounds of upgrades the game really picks up. You unlock turrets, explosives, a shotgun, and an assault rifle, all of which you can level up to increase their power. The graphics are pretty cool. I already mentioned how much I like the cat. And the shuffling of the enemies looks good. The bullets have nice effects. The music is fun but like all flash games it definitely gets old after a little while. I don’t know why every flash game seems hell bent on having the same song run on a 45 second loop for the entire game. Anyway, the defense aspect really proved to be the most strategic part of the game. When you have different levels of cakes to defend, it was nice being able to place a tower on the top or bottom so you could focus your cat-like rage on the other level or levels. And the explosives also helped add another layer to game by giving a nice area of effect attack. The game did seem kind of long, I like games with upgrades to usually last awhile, but this one seemed like it should’ve ended before it did. The end game dragged on a bit, I upgraded my weapons and pick up frequency heavily and then I would have to go several rounds before being able to afford any of the other upgrades sometimes. Very frustrating. I was also not happy that you couldn’t go back and replay levels. Now, don’t get me wrong. When you died you kept all the money you got, so on the surface you don’t need to go back. But consider this: in some later levels, the enemies are hard enough that they take a long time to kill. So, if you spent some skill money unwisely and you scraped by to get to a harder level, now you’re stuck playing this super hard level where you die really fast or you lose your cakes really fast. And you’re getting almost no kills each time. So you’re making almost no money. That’s not a good system and it makes advancing almost stop. In general, though, I felt like there were only a few spots where I felt hampered by that. And it was helpful that if you kept extra resources at the end of a level , they stuck around. You get a minimum of 30 rounds in your assault rifle every round, but if you saved 100, you’d start with 100, so that was a good way to save up on easier levels to help you on harder ones. However, once again, because the game keeps going and going, I ended up blowing my stash of weaponry way too early and that definitely slowed down the last few levels for me. I’d say it’s a very fun game, but I wish you could replay levels and/or shuffle your skills. That would improve the game immensely. I’d definitely recommend playing the game to almost anyone, but this might be a case of ‘play it until you’re too frustrated’, then you move on to something else. The end game just isn’t worth the headache. So for the scorecard, I’d give time value a 6, money value a 10, originality an 8, ryplayability a 9, and fulfillment a 6, which is a final score of 7.8. Thanks for watching everyone! Let me know what you think of Die for a Lie. I’m planning on posting a tips and tricks video for it in the coming week, so stay tuned for that! Visit www.ryviews.com for more content.